The Gregory is one the finest builidings in the Pearl District. Built in 2000 by Carroll Aspen development group, it has 133 residential condominiums, a fifth floor terrace, ground floor retail areas, and unique art deco styling. Please contact us directly if you'd like information on Pearl District condos and lofts. 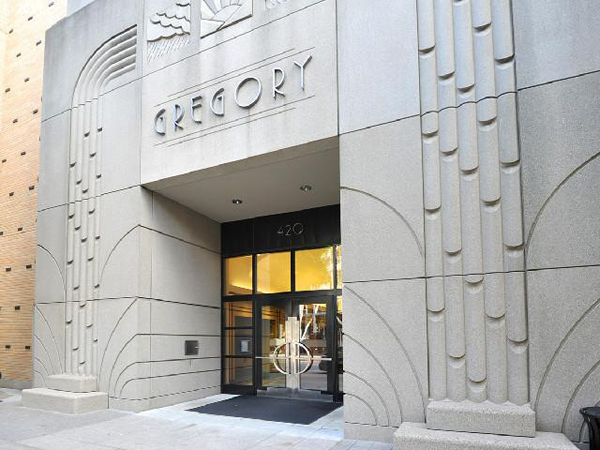 There are 10 listings found for The Gregory. Fantastic loft-style one bedroom in the heart of the Pearl District! Light, bright, and private east facing home with views of the city. Wood floors, stainless-steel appliances, and large bathroom with new washer and dryer. Home comes with 1 parking space, and oversized storage unit. Excellent value & spectacular location with some of the city's best restaurants, shopping, and grocery right out your front door. Sophisticated loft in the heart of the Pearl! Enjoy the light & bright space as you spill out to your unusually lg 12x18 east-facing patio. High ceilings and new ceiling fan. Fresh paint, new track lighting. W/D, SS appliances included. Rare custom built-in closets in bedroom. One parking space (#212), and adjoining huge storage unit (#243). This impeccable unit has been very lightly lived in! The Best Value in the Gregory - A Part Time Residence so only lightly lived in - Entry Art Corridor with Custom Lighting - Gourmet Island Kitchen with SS Appliances - Separate Bedroom Area - Large Utility/Storage Room with Custom Built-ins - Hardwood Floors - Hi-ceilings - Secured Parking Space - Appliances included. Roof Top Terrace/BBQ(5th Floor). Central Pearl location convenient to streetcar,restaurants,cafes,galleries & theater. Excellent One Bedroom Loft @ The Gregory in the heart of the Pearl District. Light & bright with 10'ceilings & east views overlooking the Amenity Courtyard. Refinished hardwood floors, custom lighting, kitchen island, new refrigerator, oversize storage/ utility room & new refrigerator. 1 parking space, W/D & custom built-ins. Great value w/an A-location to some of Portland's best restaurants & shopping. Walk Score 99. Bike Score 96. Soaring ceilings and light drenched spaces define this open-concept industrial unit in The Gregory. Imagine returning from a day exploring Portland's Pearl District to your lovely 9th floor condo and enjoy a glass of wine while enjoying views to the east through your wall of windows that open to a Juliet balcony. Wood floors, cement island & metal counters add to the cool vibe in the only Art Deco building in the Pearl. Can be a rental. Highly desired corner unit! Curved wall of windows lets in tons of natural light onto the beautifully refinished hardwood floors. Extensive built-ins helps with storage needs and hides the always useful Murphy Bed. A large kitchen island is perfect for entertaining. You will never grow tired of the city lights viewed from this fantastic Gregory condominium! One level Pearl District condo-near shopping/brews/galleries/coffee! Walkscore 99/Bikescore 96/Streetcar! 10th floor oasis w/ lrg windows, natural light, city/sunset views, high ceilings, open floor plan, wood floors, AC, Juliet balcony, granite counters, gas range, Kitchen island, lrg master suite w/ huge walk-in closet! Rooftop deck on 5th floor. Elect blinds, 2 parking, 2 storage. Easy to add 2nd bedroom! Private feel. This 10th Floor Condominium @ The Gregory boasts gorgeous Downtown and Mt.Hood views, and offers a large open floorplan. Extensively remolded in 2017 with exceptional finishes including custom doors, lighting, cabinets, hardwood floors, and new master bathroom w/marble and custom tub. Enjoy the outdoor courtyard with your favorite shops & restaurants steps away. Walk Score 99, Bike Score 96. 2 parking stall included. A spacious, open unit with unbeatable views of NW. This corner unit has south and west facing floor to ceiling windows creating an airy, light and flexible space. At the time of construction two units were combined to create a penthouse like unit. Meticulously updated with new kitchen cabinets, quartz counters and high-end appliances.